Our beautiful country is blessed with beautiful sunny weather – most of the time. However, when the rainy season hits, the amount of accidents on the roads increases. Many drivers don’t realise that their driving behaviour needs to adjust to meet the conditions of the road. The challenges. 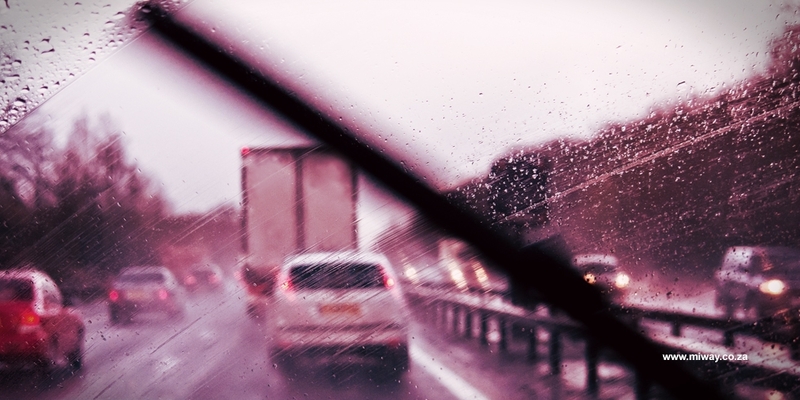 Heavy rain presents challenges such as reduced visibility, reduced steering ability, reduced traction of the vehicle’s tyres on the road and a need for an increase in space between other vehicles so that appropriate action can be taken before a collision occurs. Don’t be caught in the storm. The best way to be safe on the roads during bad weather is to avoid driving at all. If there is an extreme weather system moving through the area in which you intend to drive, and you can afford to wait it out, then rather do so. Plan ahead! For those who need to be on the road, it is essential to plan ahead for the drive! Driving in bad weather usually means a longer trip time and it is more stressful than driving in favourable conditions. You definitely do not want to have to speed through a storm to reach your destination! 1. Switch your lights on – see and be seen! 9. If you cannot see ahead, you should not drive. Did you know? MiWay car insurance clients receive warning notifications before a hailstorm is about to hit their area. We also offer our clients a quick and easy online hail claim process – just in case the damage has already been done.